Morsi's former chief of staff jailed for three years, after he was convicted of abusing his powers. A Cairo criminal court on Wednesday jailed deposed Islamist president Mohammed Morsi's former chief of staff for three years, after he was convicted of abusing his powers, AFP reported. The man, Refaa al-Tahtawi had been charged with hiring someone banned from public service, a court official said. Tahtawi had given a job to a man convicted of belonging to a terrorist group and of setting fire to several video clubs in the capital. The man, who had been sentenced in the 1990s to 15 years in prison, was himself jailed for a year on Wednesday for having accepted the appointment. Since the Egyptian army ousted Morsi, there has been a crackdown on Brotherhood supporters in the country. 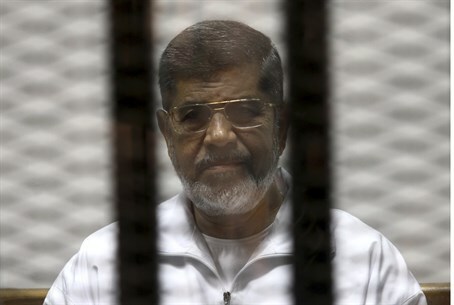 Morsi is on several trials in Egypt and is charged with, among other things, endangering national security, inciting the killings of opposition protesters and working with Lebanese and Palestinian Arab groups to carry out terror attacks in Egypt.